If you have been writing about cars for more than a quarter of a century and if, during that time, some 1500 new models have passed through your hands, the word “Wow!” is not likely to form readily on your lips in response to a car. In the presence of the new Volvo XC40, however, the wows kept streaming out of my mouth non-stop. From the outward appearance to the interior decoration, from the performance to the handling, from the accessorising to the connectivity, this car is just “wow, wow and again wow”. Since their acquisition by Geely Automotive, Volvo have been producing unquestionably the highest quality cars in the 90-year history of that noble and venerable brand. The new 90 and 60 series have already established themselves as the most desirable models in their respective classes, but the XC40 advances Volvo’s renaissance by an exponential step. Despite the excellence of the cars that have come before, we just had no idea that they were capable of this. First knockout is delivered with the first glance. The wheels on the corners of the body and the tapered rear wider than the front give the XC40 a perky, cheeky stance which is decades more youthful than the Hush Puppy and flat cap brigade that have been Volvo’s stalwart customers for yonks. 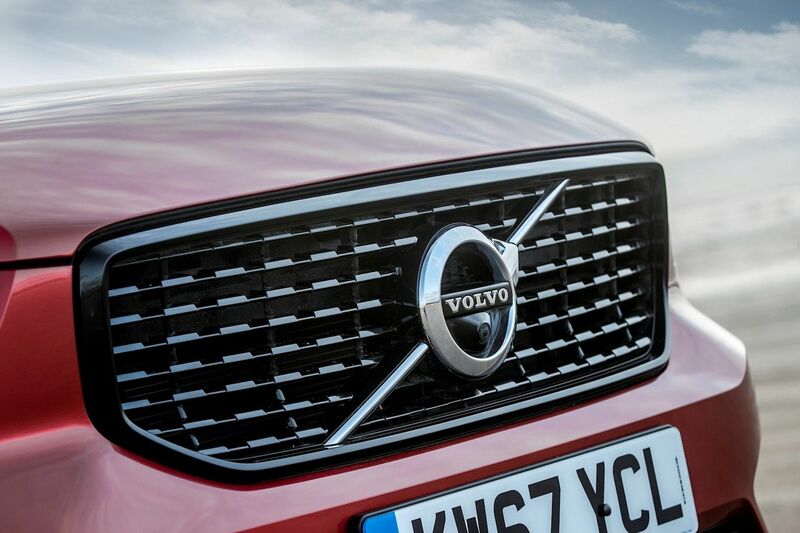 The clamshell bonnet, concave grille and heavily sculpted doors all bespeak a design energy and brio that we haven’t seen in a Volvo in millennia. When – apart from the P1800 of beloved memory – did a Volvo’s looks ever make you smile? Next knockout is the interior. At the recent launch event in Scotland, only XC40s in top-of-the-line First Edition spec were available so the gorgeous, shimmering surfaces of piano black and the sumptuous leather/Nubuck seat upholsteries may not be common throughout the range. But the nine-inch centre console familiar from the 90 and 60 ranges is standard to all XC40s, as is their unmatched battery of driver safety aids. Volvo has declared as a corporate policy aim the intention that no Volvo driver or passenger should be killed or seriously injured in a Volvo by 2020. To that wholly desirable and admirable end, the XC40 brims with lane mitigation aids and run-off protections and city safety sentries that keep an eye out for pedestrians and cyclists crossing your path all round the car. Clever touches abound. The glovebox includes a fold-out hook for takeaways and slots in the dashboard by the steering wheel will store credit and service cards, ensuring you’ve got them ready when they are needed. The parcel shelf can be removed and stowed beneath the luggage compartment floor, while a flexible floor also includes hooks to help secure shopping bags. Perhaps the most enticing of all developments with the XC40 is the offer of a care package which, for an all-in price under £800 a month, gives you the purchase and insurance of the car, together with maintenance, valet service, the loan of another Volvo – if, for instance, you want to use an XC90 to go skiing – for up to a fortnight. This kind of intelligence truly reflects Volvo’s commitment to making cars that match their customers’ needs. As does the XC40’s peppy performance. Two engine variants were available at the launch – the 247 bhp T5 with eight-speed automatic transmission and all-wheel drive and the 190 bhp D4 also with eight-speed and AWD. Both share Volvo’s all-new CMA (Compact Modular Architecture) platform which will underpin all of Volvo’s coming 40 series models and both came with R-design suspension settings for enhanced grip and road-holding. On empty roads studded with a succession of roundabouts, I gave both versions a belting work-out, resulting in fuel consumption in single figures and tyres and brakes so hot they were fuming when I finished. With each car, “wow” was the only fitting word. The T5, with 0-60 mph in just over six seconds, is more like a hot hatch than a mimsy compact SUV but what matters more in both cars is rock-solid handling and electric responsiveness. Among my leading thoughts about this car was a longing to win £1m on the Premium Bonds so that I could give an XC40 to my wife. I knew she would love it. When I told Volvo execs about this thought, they quietly acknowledged that women owners are leading targets for the marketing of the XC40, though they couldn’t be drawn into a discussion of the split between expected male and female purchasers. I am looking forward to an extended loan of an XC40 so that I can find out what my wife feels about it and shall report further on those findings. In the meantime, for my money and even though we are still in the first quarter of 2108, the XC40 is Car of the Year by a country mile.